Novotrade are barely known in the gaming world nowadays. The company itself may not be known but its classic game Ecco the Dolphin probably is. Another game by Novotrade that didn’t become as popular as the Ecco series was Kolibri a game similar to Ecco in many ways but different in others. It was only released on the Sega 32X, the failed console that Sega probably don’t want to hear about ever again. It was released in 1995 which was when the gaming world was slowly changing from 16-bit consoles to 32-bit consoles. The storyline of Kolibri is really complicated and long which isn’t unusual. I thought the Ecco storylines were over the top but this one really takes the biscuit. Basically, a crystal that landed on earth and was preserving all the goodness of the environment has been replaced by a new dark crystal that does exactly the opposite. As the crystal comes into the earth as a meteorite the humming bird Kolibri is granted all the good from the old crystal which then gets destroyed. Kolibri is the only one who can stop the dark crystal from taking over the world. Pretty cheesy but enjoyable in a way. The genre of Kolibri is a shooter, not a puzzle game like what Ecco was. Essentially, all you have to do is trash all of the enemies in an area so your humming bird friends can take back what evil forces stole from them. Using the powers of the crystal you can fire energy from your beak which can kill anything that attacks you. Like most shooters enemies appear from all over and you have to blow them away. It is incredibly fun and even better if you hate wasps. You have to clear areas of insects by shooting them with your array of bizarre weapons. Like most shooters there are quite a lot of different weapons you can use to kill enemies. The types of weapons are lasers, missiles, and bombs, which can either home onto enemies or just fire straight ahead. Some obviously do more damage than others but most of the weapons have a large impact on enemies, apart from the default gun, which is useless. The weapons in Kolibri are good but some variety would have been nice. In the end, though, they are quite good. Enemies in the game consist of an army of insects like wasps, which come flying at you in the levels. Most enemies like insects are fairly easy to kill and all you really have to do is shoot them once or twice to take them down. Some enemies however are invulnerable like the toad. The toad sits in the background and will instantly kill you is you come too close. Most of the enemies that attack you will do it in similar ways and become fairly simple to defeat later on in the game. 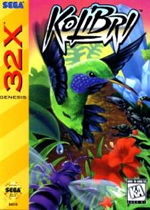 Kolibri shines graphically, as the game sports the best 2D graphics on the 32X. This may not be anything to brag about but the fact is that the game has lush graphics, which are pleasing to watch. The sprites are wonderfully drawn and look truly realistic. The birds, insects, and the frogs look absolutely brilliant and I find no fault in them. The fact that there is a huge amount of detail in everything makes it great in graphics and is enjoyable just to watch. I have to say that some of the graphics in the game are almost realistic especially the toad sprites which look immense. It is honestly the best sprite I have ever seen on the system. If you thought Ecco on the Sega Genesis was realistic then you will be blown away by this game. The graphics are really bright and colourful which makes the game look even better, really showing how powerful the 32X is over the Genesis. The 32-bit upgrade really shines here and every single aspect of the graphics look really impressive. The backgrounds in Kolibri are also bright and colourful. The wonderful back drops of the forest on the first few levels looks impressive and really are lovely to look at. The well-drawn levels are really worth watching and I guess watching it, it is really amazing and is a huge improvement over some games on the 32X and also on the main console rival at the time the SNES. The general graphics of Kolibri are really impressive and are brilliant on the 32X. I have to say that they are the best graphics on the system, better than Virtua Fighter. 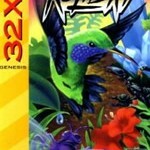 If you are not too familiar with the 32X then you won’t know of the awful sound processor that had infected it. Out of all of the 32X games I have played, only one of them has enjoyable sound and Kolibri isn’t the game I have in mind. The music tries to be relaxing and attempts to show how peaceful the game attempts to be. If you’ve played Ecco then you will have a brief idea of what Kolibri sounds like. The music is always really slow which emphasizes a peaceful game, which it is in a way. The problem with the music is that it tends to drone on a lot and sounds really bad when turned up. The sound effects are also not that great and are just as bad as the music. The annoying noise of Kolibri’s gun is something that obviously is repeated all of the time because you are constantly firing at bad guys. Other sound effects tend to be really quiet and just sound pathetic. I wasn’t really expecting anything special when I first played and neither should you, so don’t turn the sound up when you play the game because it is just plain bad. Kolibri is a strange game that never stops amazing me because of its originality. Although it is an average shooter game in a unusual theme, the game play isn’t anything special. The audio is terrible because of the weak processor of the system but graphically it is really impressive and looks lovely. The final verdict is that: if you are a game collector and are into 32X games then I recommend buying, but if you are an Ecco fan then I reckon you should play it before you buy because you may not enjoy it as much. Attractive graphics, appealing concept, decent music…and terrible play control, annoyingly cheap enemy spawn patterns, and gameplay that manages to both be shallow and confusing (mainly because the manual is needlessly obscure). The designers had some nice ideas, but the game itself is no unsung classic — I didn’t enjoy it much at all. Very pretty and beautiful game, a big plus for the co-op gameplay option. Has some original ideas for a shooting game (for example a few puzzles). On the other hand, it may not be as engaging as you’d want a game of this type to be and the music isn’t on par with the graphics.